My Money is designed to work with SQL compatible relational databases, default database engine in My Money is Apache Derby, a modern database engine with a storied pedigree. Sometimes it is necessary to be able to connect to the database from outside My Money, for example to visualize the table structure, design a complicated query for a report or take a data snapshot. 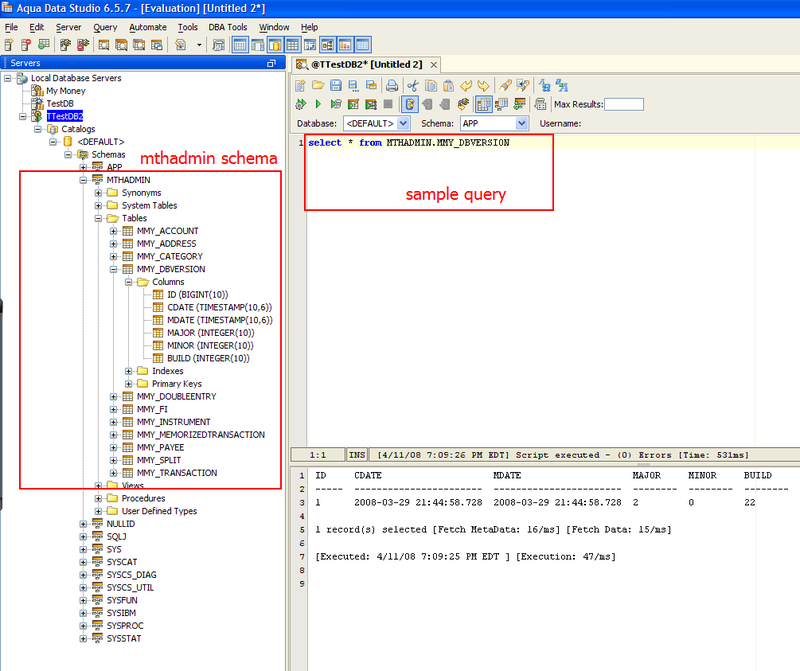 If you are using default database engine (Derby) it is very easy to connect using many 3rd party applications. We normally use a Toad, but our recent favorite is AquaFold AquaStudio, absolutely amazing tool available for both Windows and Mac. For the purposes of this article we will assume that we are using AquaStudio, any recent version 6.4 or better can connect to My Money. There is a free 30 day evaluation license available, so you can take it for a test ride. We have used both Windows and Mac versions of this tool, and they both work great. The only drawback is that the Mac version has a strange interface to open and save files, it takes a little bit of time to understand where the documents folder is for example. Please note that MTH Software is no way associated with AquaStudio, we just happen to like their product. Once you have started the AquaStudio you will need to mount My Money database, or in AquaStudio lingo "Register a new Server"
Once connected you can expand the My Money database and work with it as you would with any other SQL database.